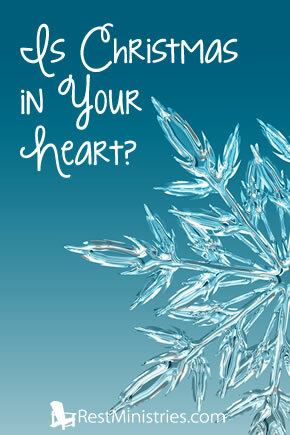 Is Christmas in Your Heart? As Christmas Day approaches we may be feeling the expectations, the disappointments, the stress of our body not doing what our head imagined? Sandi shares. “The people walking in the darkness have seen a great light; on those living in the land of the shadow of death a light has dawned, You have enlarged the nation and increased their joy . . . for unto us a Child is born, to us a Son is given” (Isaiah 9:2-3,6). “But Mary treasured up all these things and pondered them in her heart” (Luke 2:19). It is a great mystery that often gets lost in all of the hustle and bustle of the whole holiday season. Our calendars are full, our children are squirming with an overload of expectations! Those of us with chronic pain and disabilities feel like we are losing who we used to be as we can do less and less each year. Instead of thinking of all we have lost due to the pain and disability of our illnesses, ponder these things. There is a great Light! Our Lord has increased our JOY! Don’t you see? A Child is born! Several Christmas’ past our family was enjoying one of our favorite traditions. Simply piling into our car and going on a Christmas light drive. So fun! We wandered into an upscale neighborhood that we had never been to before. The big houses were decked out in elaborate displays! Frosty and Rudolph were mixing it up with Santa’s sleigh and manger scenes. Other homes were more traditional looking with wreaths and candles in the window. After a while we were getting cold and wanting to head home. We wandered trying to find our way out to the main road. We quickly realized we were lost! The streets were often one way, and ended in little cul-de-sacs. Every time we though we were out we ended up in another tangle. My husband sent up a quick prayer, and we found it. It was sitting atop a building on the main road, and as long as we kept heading in that general direction we found our way out. We had our own little version of “walking in the darkness and seeing a great Light!” The Star led us out. Take some quiet time this Christmas. Ponder these things in your heart. There are great mysteries, and great JOY this Christmas. Prayer: Oh Lord, thank You sounds so insufficient for all You have given us. Forgive us for thinking of all we have lost. Help us to have a hunger for more of You in our lives. We thank You and praise You for Your many blessings Amen. Sandra Platt has had Fibromyalgia for 26 years, and now has several severe Autoimmune illnesses as well. She tries to bravely face life and write about all joyful things the Lord has taught her. She has 3 adult “kids” who are very cool. She has been a Pastor’s wife for 26 years, and lives in rural Indiana. This Christmas I urge you to take some quiet time, and ponder the mysteries of this amazing season. Remember the times God has blessed you in a way only He could. Remember that He is the only reason for this season. Filed Under: Devotionals, Holidays, Loneliness, Overwhelmed, What's New? 4 Responses to Is Christmas in Your Heart? That is so neat that the Star led you out of darkness and guided you to find the way. Thank you for sharing this, Sandi. It adds a deeper meaning to your post and the verses you shared. It gives such hope that God will never leave us lost and in darkness but will always lead us out and guide us with His Light. I hope you may have a peace-filled Christmas and extra strength to enjoy it. Trudy, Merry Christmas! You are such an encourager being here every day. I love it that God finds so many creative ways to show His love and care for us! We just need to remember to watch for them. I pray His light and love is with you this Christmas. “There is a great Light! Our Lord has increased our JOY! A child is born!” – and doesn’t that make all the difference. Thanks so much for your wonderful reminder of that. Praying your Christmas will be filled with His light, dear friend. I am so thankful for our friendship through the years!